If you’ve been reading my recent posts then you’ll know that my skin is being a bit of a nightmare. I’ve had blemishes pretty much everywhere and it’s really getting me down, especially as I’m drinking more water than ever, cut down on sugar and not switching up my skincare too often. Basically, my skin has morphed back into being a 14 year old teen who is throwing a strop. So, aside from the copious amounts of concealer, I’ve been relying on the above staples to help improve my complexion. Starting with my cleanser, the Emma Hardie Moringa Cleansing Balm has always been a favourite of mine. It leaves my skin soft, hydrated and it removes every trace of makeup while it’s at it. Nothing makes my skin look as nice as this does and the fact that I’m on to my fourth or fifth tub proves it! Following this, I’ve been spraying on the La Roche-Posay Serozinc, as the zinc in it is supposed to be good for blemishes, congested skin and general breakouts. I never fully know what sprays and toners do, but all of the ingredients are there that will help my skin’s current state, and it has been improving since I started spritzing this twice a day. 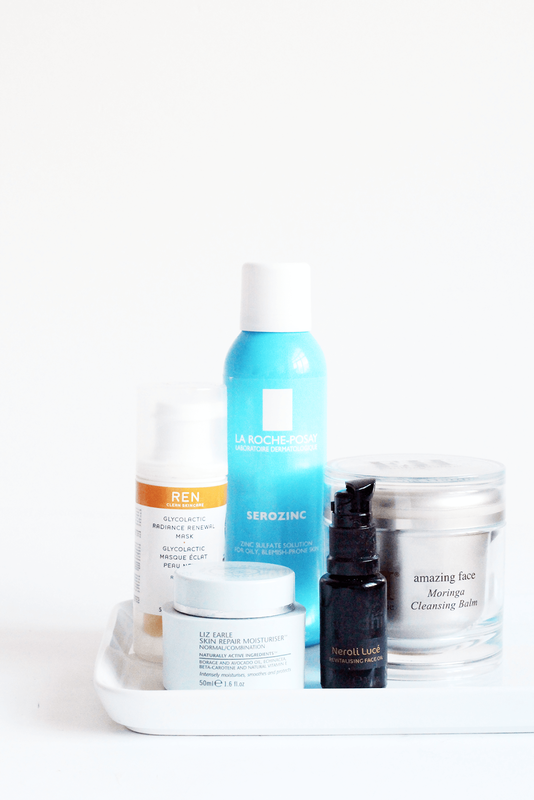 If it’s looking a bit dull, or if I have blemish scars remaining, I always use the REN Glycolactic Radiance Renewal Mask. I’ve mentioned this many times, as I can’t fault REN masks, but it works to buff away dead skin cells, leaving your complexion brighter and glowing. I honestly love this stuff and it really makes a difference to my skin! On an evening, I’ve been using the Bodhi and Birch Neroli Luce Revitalising Facial Oil, as they mentioned on twitter the other day that it’s good for blemishes. I forgot I had it, so grabbed it out of my stash and have been using it for the past few days. It really helps hydrate the skin, spots heal quicker when using it and overall it just gives skin a boost! Finally, I’ve went back to basics with the good ol’ Liz Earle Skin Repair Moisturiser. I love Liz Earle as they’re a brand I can always go back to when my skin is playing up. This particular moisturiser is aimed at normal to combination skin and I find, despite it being thick on application, it comforts my skin while adding much needed moisture, but doesn’t make it oily. What do you use when your skin is having a bit of a nightmare? Make sure you enter my USA beauty giveaway and my £400 Sophia Wesbter shoes competition!